Shelton Instruments Limited, of White Lion Street near Angel Tube Station in London's Islington, had been started back in 1970i by Chris Shelton, who ended up working a stint at Nascom - once the UK's top selling kit micro manufacturer - where he designed the Nascom 1. 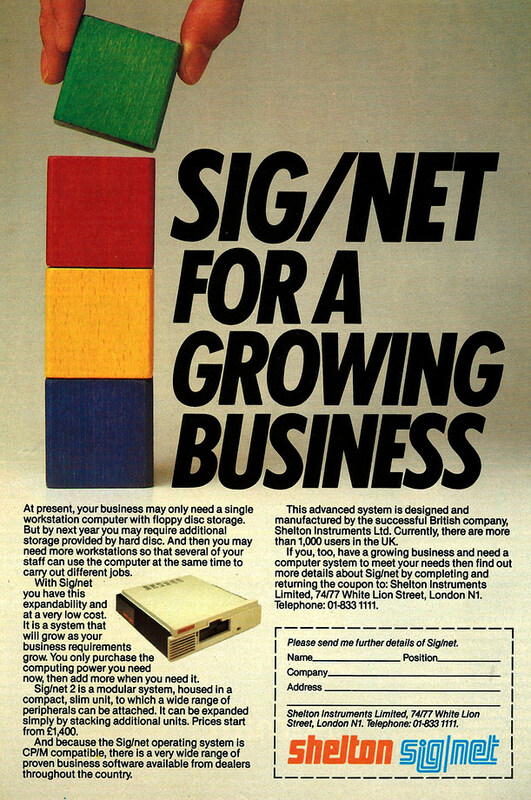 The advert is for the Sig/Net, which Shelton also designed - a modular system which was CP/M "compatible". The base unit supported one user with a floppy disk, but additional units could be stacked to add more users or more disk storage. A single module started from £1,400 - about £4,700 in 2019.